Thank you for considering making our company your choice for your automotive service needs. My staff and I are grateful you are here and we want to help make it easier to learn more about the reasons so many Camarillo residents trust and rely on us year after year. Take a moment to click on the questions below to learn more. 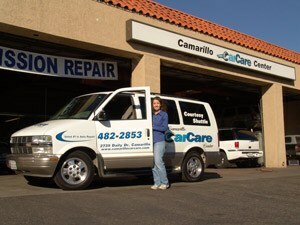 Why Should I Choose Your Auto Repair Shop? 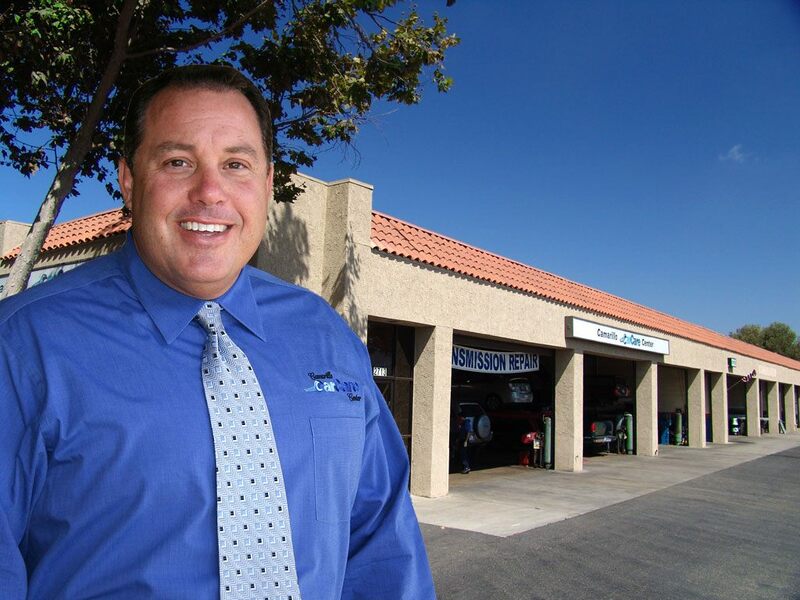 12 Years Chosen Best Auto Repair by Ventura County Star Readers: Each year the Ventura County Star newspaper asks its readers to vote for their favorite companies. For 12 years, we have been voted #1 for auto repair by them. Remember, that’s not us telling you how great we are, that’s our customers. 99% Customer Satisfaction from AAA Surveys. Each year they take hundreds of our repair orders and survey them. Each year we rank right at the top with 97% or better Customer Satisfaction! 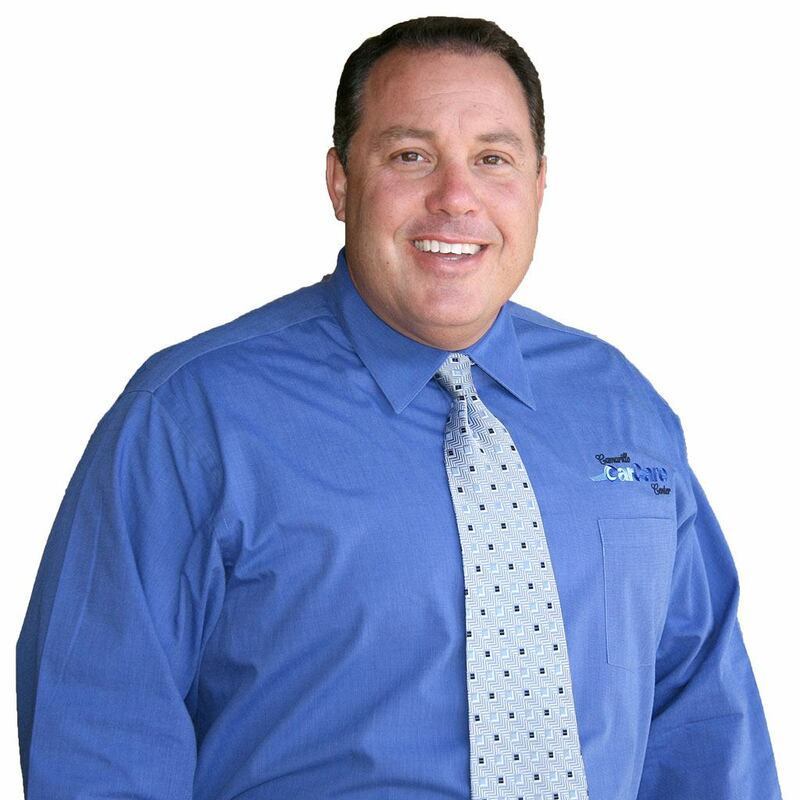 That is great for any company, but even better for auto repair. Large Facility to serve you faster and better: We have 13 service bays with state-of-the-art equipment. This means we can get your vehicle serviced quicker and expertly. ASE Blue Seal of Excellence Recognized Business: There are over 750 registered shops in Ventura County. 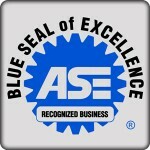 Only 3 of us are recognized with this esteem status from the Institute for Automotive Service Excellence (ASE). This means our staff is extremely well qualified to provide the service for your vehicles. We are a full service auto repair facility. We service almost all major brands of vehicles. We do provide some service on RV’s, just call and ask. We provide expert service on your Hybrid vehicle. We can handle your full size work truck too. Call us for details. 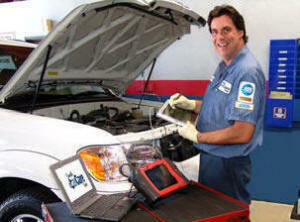 We provide the entire gamut of auto repair, maintenance and diagnostic services. If you have any further questions, please review the menus above or call our staff. We are always easy to talk with and don’t mind your questions. Our shop is neat and clean. We are also constantly in the process of upgrading and improving the looks and conveniences for our customers. Our technicians keep clean work areas that are organized for effectiveness. We provide them with an organized and efficient work area that maximizes their time so your service is performed as swiftly as possible. Here is a Photo Slideshow with many pictures of our shop, inside and out. We realize you get too busy to call us during our business hours, especially if you work for a living. That’s why we have developed a convenient online appointment scheduler that is available 24 hours a day. The one thing people say they like most about our shop is how we care for them. It’s true, we are caring people first. We care about you and your vehicles. We are sensitive to the inconvenience you experience with auto service and to the costs. We have structured our shop to make your experience as quick, affordable and convenient as possible. It’s natural for our staff to treat you with respect and kindness (we screen for this in a big way when hiring). Where other shops may talk down to you, or have some kind of attitude, we don’t do either. We talk to you on your level, and we never talk down to you. We inform you of your choices and help with with the right advice you need when you need it. This is probably the main reason that so many people have chosen us as the #1 Auto Repair Shop winner in the Ventura County Star Newspaper for 12 Years. Are You AAA Approved & Whats Your Rating? 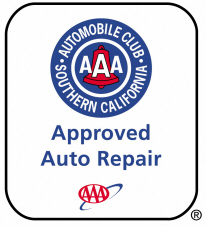 Yes, we are one of the esteemed AAA Approved Auto Repair facilities. We have been AAA Approved for over 25 years. Part of staying qualified as an approved shop, AAA requires that we provide them with hundreds of our actual repair orders. They take them and conduct a survey of our customers. Survey participants included AAA members and non-members. We will continue to work hard to earn that rating. It means a lot to us and to the members of AAA. We are NOT a shop that cuts corners on your repairs and service. Therefore, we are not the cheap shop in town. However, we are not the most expensive either. Typically, we are about the same for other shops in the county that have the high standards as our company. In other words, when you find a shop that hires the top-notch technicians, uses the finest quality parts and fluids and is current on equipment and resources, we will be about the same price. Our shuttle service makes getting your car serviced easier. All you do is show up at the shop with your car for your appointment and Karen, our friendly shuttle driver, will take you to work or home. Then, when your car is ready, she’ll be there to pick you up and drop you off at the shop. How’s that for easy? It’s sure easier than arranging a ride with a co-worker, friend or family member. Some people are timid about using our shuttle service because they have used them at the dealerships. The dealerships often have you wait some time before the shuttle arrives. Then they pack the van with customers from all over the area and your drive can be a long time. At our shop, we do it differently. Typically, you are the only one in the shuttle van. This way, you don’t usually have to wait for the van to show up and then it drives you directly to your home or business. 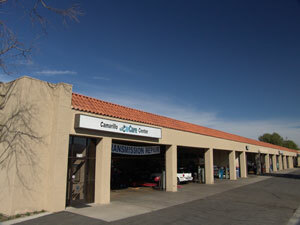 Camarillo Car Care Center started here in Camarillo in 1973. The company grew from just a small two bay shop in the Arco station on Arniell Road to the large 13 bay facility on Daily Drive. The company is recognized with a long standing reputation for outstanding workmanship and a caring dedication to our customers. We KNOW you demand that your service to be done right the first time. That way you can drive away feeling safe and feeling peace of mind that you won’t be inconvenienced with an unwanted return to our shop. Our Technicians and our Service Advisors are ASE Certified or better. 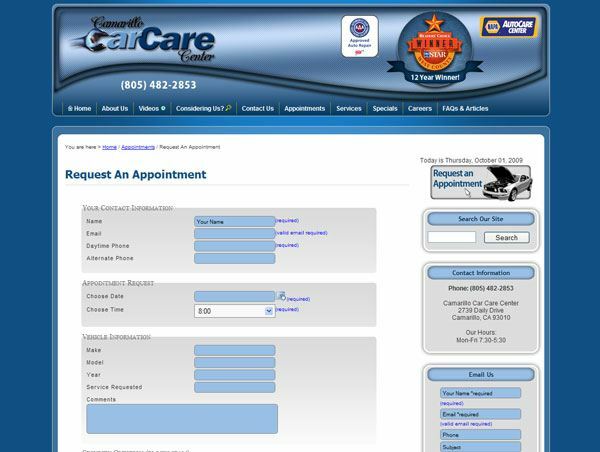 Very few shops in California commit to training and experience as well as Camarillo Car Care Center. Only the shops with the best credentials and dedication to training and certification qualify for this awarding. We are proud of our high quality staff or service advisors and technicians. We know you’ll rest easy knowing you are good hands at our shop.